An estimated 10,000 people from Central America have arrived at or are approaching the U.S.-Mexico border after traveling through Mexico. 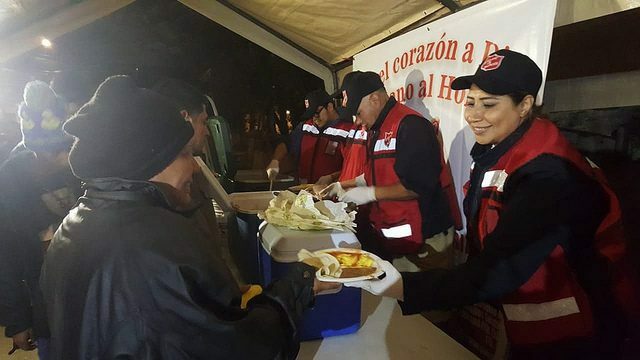 While some have crossed into the U.S. seeking asylum, several thousand of these migrants have congregated in the northern city of Tijuana, where The Salvation Army and other aid agencies are providing essential services. The caravan started in Honduras—where the vast majority of its members originate—but its numbers have grown as it has traveled north, with people from El Salvador, Guatemala and Nicaragua joining. Most of the people are fleeing extreme poverty, gang violence and a lack of employment. The caravan provided an opportunity to travel with others, providing safety in numbers. Along the way, local communities—including some Salvation Army centers—have provided food, drink and shelter. Most of the migrants plan to seek asylum in the U.S., but almost 1,800 of the original group have already sought asylum in Mexico. In Tijuana, which is also home to a sizeable transient Mexican population that seeks refuge in the U.S., The Salvation Army is supplying 2,000 backpacks and nearly 2,500 personal hygiene kits. Around 8,000 individuals will also be assisted with information and advice, access to legal aid, assistance with identification documentation and the paperwork associated with the legal aspects of registering for asylum. Practical issues, such as the need for cooking facilities and clothing, are also being addressed. Donate to support the effort with The Salvation Army’s Americas and Caribbean Disaster Fund.